When you first have your new baby home from the hospital, it’s almost impossible to put them down, you just always want to be by their side. Am I right? But as much as you’d love to hold and cuddle your baby every moment of the day, you will eventually need to put them down, especially when your muscles start to ache or when you need to grab a quick shower. This is why a baby swing can be an absolute lifesaver during your baby’s first few months at home. I know what you’re thinking right now! You are already over crowded with baby essentials and you feel like you have no place to put any more stuff. Well, don’t worry. There are now a lot of manufacturers making compact, space-saving baby swings, ideal for small spaces. But I have to warn you, choosing the best baby swing for small spaces can be very difficult. There are a lot of choices out there. To help you choose the perfect compact baby swing for your new arrival, I have listed down below a choice of five fabulous baby swings you can purchase in the market today. I hope this will help you choose one that will suit you and your baby’s need. So please keep on reading below. The Fisher-Price Sweet Snugapuppy Dreams Cradle ‘n’ Swing is one of the most popular baby swings on the market today, and all for good reasons. This super functional baby swing is equipped with high-tech features and can calm baby in many different ways. First of all, it features smart technology that detects your baby’s weight. When your little angel grows, the swing speed, as well as the frequency, will automatically adjust according to your baby’s weight. It also comes with two swing directions. In addition to the regular back-and-forth, it will also swing from side to side. There are also six different swing speeds that will fit your baby’s preference. Plus there are 16 songs along with natural music that will help you when your baby starts to get fussy. But what’s even more interesting is this product’s Smart Connect technology that allows you to connect the baby swing to your mobile device. In this way, you will be able to control all of its features like starting the rocker, changing the speed or the motions or activating the sounds, all with just a tap of your finger. You can do all of this from up to 164 feet away. You can choose between battery or plug-in options that will help you reduce the cost and frequency buying a costly battery. The plush seat pad is machine-washable. On top of these great features, Fisher-Price Sweet Snugapuppy Dreams Cradle ‘n’ Swing comes in a compact size so it won’t take up so much space. Moving it around the home is very easy and making use of this Compact Baby Swing during your travels can be really stress-free. If you want to save more floor space or if you have a small apartment, nothing can beat a foldable baby swing. Whenever you are not using it, you can easily fold it up and conveniently store it in a closet. And if your budget is limited, you will love this baby gear even more. But what I like most about this baby swing is that it has an adjustable height. You can choose the higher setting to make it easier for you to get your baby in and out of the seat, then you can choose the shorter setting to keep baby closer to the ground and avoid falling. You can also choose the swing speed according to what’s comfortable with your baby; but take note, it will only swing from head to toe. This is also a portable baby swing, it’s very lightweight and can be easily moved around. It has carry handle that makes transporting it a breeze. This baby swing prioritizes safety. It features a 5-point harness so you don’t have to worry when you’re away. It also comes with head support, which is removable when your baby gets stronger. Its battery life is much longer than other types, meaning you will be able to use it for about three months even with daily use. There are toy balls hanging on the toy bar that I’m sure your child will find very entertaining. 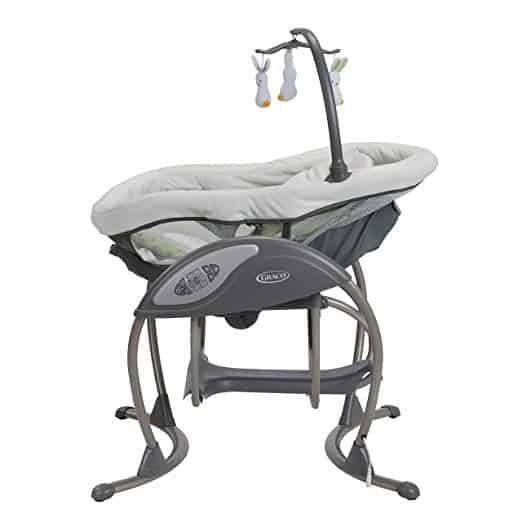 With its budget-friendly price, Graco Slim Spaces Compact Baby Swing will be able to provide the quality and functionality you need for your baby. Anyone who has a limited amount of space and is in need of a great baby swing may want to take a look at this swing model by Fisher-Price. This baby swing doubles as a baby seat, so you have a swing and a seat in just one compact design, making it great for those with small living spaces as well as those who need to carry a swing around with them during family trips. 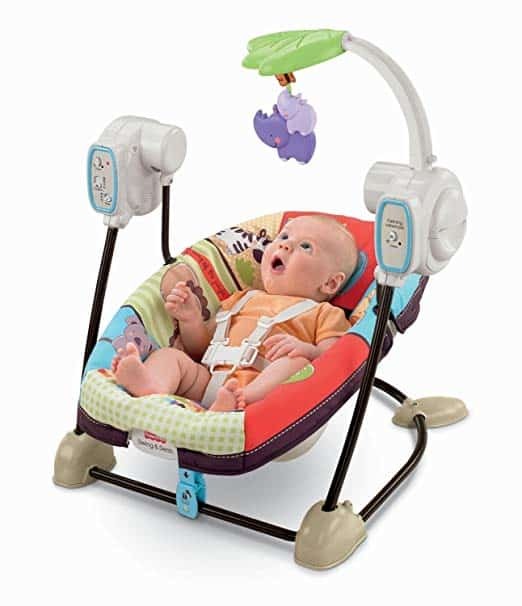 It is very easy to convert this swing into a baby seat, all you have to do is connect the seat to the bottom stand and you can immediately set your baby in an immobile position. You will be able to enjoy different benefits without purchasing two separate devices. It has an incredibly soft seat pad that will help baby feel so relaxed while they are on the swing. The baby gear has been designed with safety in mind. It features a five-point harness that can be easily removed for cleaning; it is machine-washable too. It also has non-skid feet to prevent any unexpected danger. This swing also features an exceptional and dependable battery system you can use whenever there is no electricity. It comes with remarkable high quality music facilities – there’s one you can play when your baby is sleeping, while the other one is just perfect when you want to entertain a crying baby. It is made with strong metalcore metal. You can be sure that it will last longer and will be able to endure rough use. 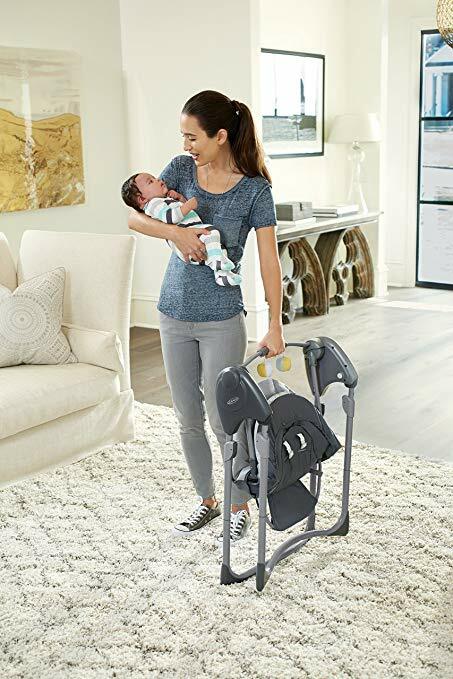 If you’re short on space and don’t want your baby swing to crowd your small home or apartment, this 2-in-1 baby swing and baby seat by Fisher-Price will definitely be your best bet. You no longer have to purchase a separate bouncy seat, so this means you will not only save some space but some cash too. Here’s another two-in-one product that I’m sure every parent would love, especially those who are looking for an all-rounder solution to saving plenty of space. This time it’s a gliding swing seat that doubles as a sleeper. This product by Graco features dual mechanism technology that will allow you to easily transform the swing into a comfortable sleeper so your baby can have a perfect sleep, and you will no longer have to move your baby to his sleeper or crib. And I must say, the seat is definitely its best feature. The seat comes in a soft, washable insert to make sure your baby will feel more than comfortable enough as he swings or sleeps. The seat also transitions to three different sitting positions. First, it has been designed to sit up when he’s awake. 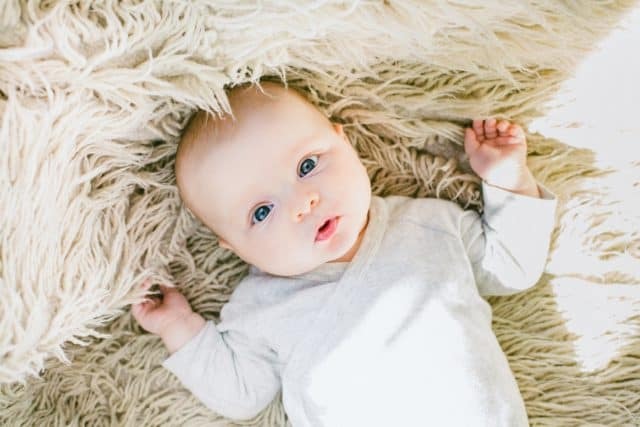 Then the second option will allow for a lower recline while your baby’s head is still elevated; this is great especially for babies with reflux and must stay elevated while resting. The last position is for your little one to lay almost flat for a happy sleep. Another thing I like the most about this baby swing is that despite its compact design, it offers enough seat to prevent your baby from feeling suffocated and give your child enough room to play or sleep with absolute comfort. It comes with nature sounds and classical melodies so your baby can be soothed and relaxed. You will find a toy bar at the top of the glider. It includes three adorable little owls that I’m sure your little one will totally adore and find to be engaging. There are six easily-adjustable swing speeds and two modes of vibration you get to choose according to the preference and comfort level of your baby. It has cozy seat body support and there’s a three-point harness with cover to keep your baby safe and secure. It can hold up to 30 pounds, so you will still get plenty of usage out of this baby gear as your baby grows. With the amazing features of this baby swing and sleeper, I’m sure you will find it to be a blessing in disguise, especially if you have just entered into the challenging yet beautiful parenthood life. When it comes to baby bouncers, BABYBJORN always stands out from the pack and this bouncing seat is no exception. It has been well loved by many parents not only because of its beautiful design but also with its ability to pacify cranky babies. What makes this baby gear amazing is its ergonomic design that gives your baby full support on their spine, neck, head and overall posture. This is very important especially for babies who don’t have fully developed muscles yet. On top of that, it will naturally teach your baby how to balance, allowing him to develop his motor skills. You know you can trust BABYBJORN as they develop their products by closely working in partnership with leading pediatric doctors, midwives, and even child psychologists. There are four available positions you can choose from depending if your little one is playing or resting. When you are not using it, you can just fold it flat compactly for easy storage. So I’m sure every parent living in small houses or apartments will like it. Furthermore, this seat has a lightweight design so it is easy to transport when you travel or even just moving around your home, especially that it doesn’t run on any electricity. You can literally use it anywhere. This bouncer will be perfect as a seat for your child up to the age of 2, meaning its shelf life isn’t just for a few months, making it worthy of your money. Of course, blowouts and spit ups will absolutely happen. So it’s good to know that the cover on this machine is washable. You can make sure it stays clean all through the course. It comes with a three-point safety harness that lets you buckle your baby in. All the fabrics used for this baby gear are free from any substances that might be hazardous for your baby’s health. The seat is made from 100% organically grown cotton while the mesh fabric used on its three-point safety harness as well as padding was also made from 100% polyester. You won’t have to worry just in case you find your baby chewing or sucking on the fabric. You can choose among eight solid color choices so it will effortlessly blend to your baby’s room. The colors available are Beige/Grey, Black/Dark Grey, Black/Grey, Dark Grey/Grey, Khaki/Beige, Rust/Orange and Silver/White. Overall, this small and compact bouncing seat has a flawless design and amazing features, making it a must for every parent. But before you go shopping, here are a couple of helpful tips that you should keep in mind when choosing the best baby swing for you. First of all, you need to consider your limited space or the area you have in mind to use the swing. Don’t forget to check the actual dimension of the product and see if it is close to what you are looking for. It should be as compact as possible. It should also be easy to fold and take up a small space when folded. And just like any other baby product, make sure that the baby swing will be safe and comfortable for your baby. Look for a swing with a wide and sturdy frame that is low to the ground to prevent it from tipping over if your baby leans to one side. It should also have a restraint, like a 3-point or 5-point harness similar to a car seat to keep the baby safe and secure in their seat. A baby swing with hip resistant is also highly recommended, especially for newborns to keep your baby from slipping around inside the swing. The seat should also be comfortable enough. It should be nicely padded and have head support that will cradle your baby in comfort. Make sure it’s also made from high-quality materials suitable for newborn delicate skin. Some baby swings even come with controllable speed to provide your baby with comforting motion. There are also baby swings with multiple choices of reclining positions to accommodate your baby’s needs and can help to comfort them better. It’s also important to have a baby swing with removable covers that are washable. Diaper overflow, drool and spit-up is very common in a baby’s early months. A baby can absolutely create more mess than you will ever imagine and a removable, washable cover can make your life a lot easier. It will help you keep the swing clean and your baby healthy. Other features you need consider includes the portability of the baby swing, especially if you will be traveling a lot or will be visiting grandparents every weekend. You will want something that is not much trouble to take with you. Furthermore, you also need to consider its power source. Most swings can run via an AC adapter or battery power, while some swings can have both options, which is great. You can use it at home via AC adapter and not waste battery power or fear the battery might suddenly run down. And if you don’t have an outlet where you want the swing, the battery will come in handy. Check out these baby crib reviews here, ideal for small spaces. A baby swing is indeed a lifesaver for every parent, especially during their first few months. Of course, nothing could ever replace your loving arms, but a baby swing will bring comfort to your little one when you need some free time to do other important things. 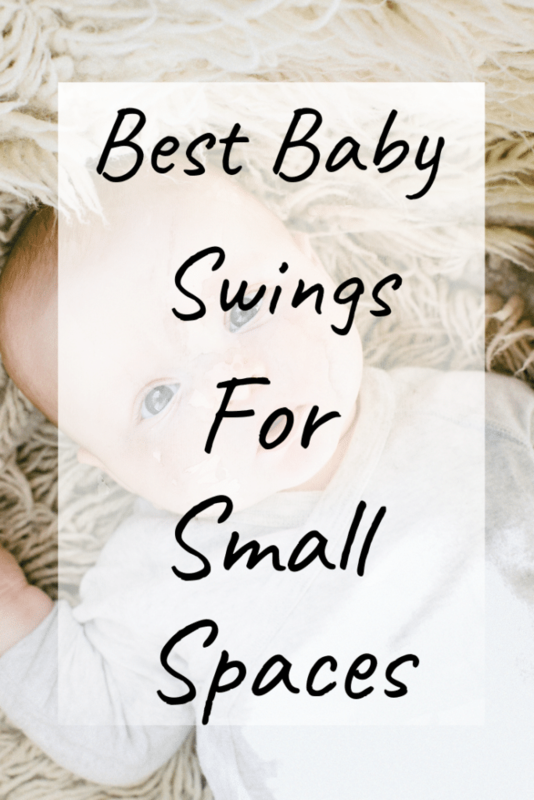 Anyway, I hope the Best Baby Swings For Small Spaces mentioned above will help you find the one that will suit your baby’s needs. All these products have been specially designed to save you a significant amount of space and at the same time give you amazing features to soothe and entertain your baby.